Many people are surprised when they walk into their exam room for one main reason – they are not the only ones there! With the exception of the exams held in rural and small city centers, there can be quite a few people writing at one time. This December, Winnipeg is expecting over 100 students alone that day! This includes everyone from our discussion classes as well as students who chose the self-study option and are working on rewrites. That is why we always tell people to arrive early to get their choice of seats and to help us get everyone registered by the time the exam starts. We will have the full team out from IBAM to get everyone settled in time but that number of people can definitely be a challenge. But what is everyone writing? 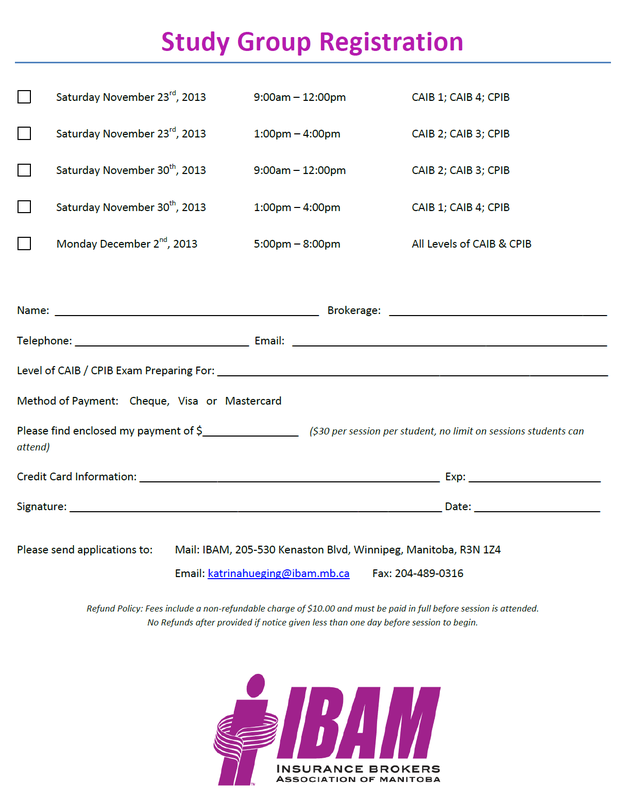 Many of the students are writing their CAIB exams but a few are writing their CPIB exams and even their CCIB exams. That is a lot of acronyms to keep track of!! I always would caution my students to never gauge how you are doing on your exam with how others in the room are doing. You will notice when you open the exam booklet that everyone has different colored exams – these indicate which exam everyone is writing. So do not panic when the person next to you is writing a 2 page essay while you are only answering short form questions… your book might be green and theirs yellow indicating you are taking completely different courses. The exam will start at 9:00am with students asked not to come any later than 8:45am in order to get everyone seated in time. You will have from 9am until 12:30 to write with no extensions for time. Be sure to use the entire time given to you. Even if you finish early, check and see if everyone else around you is done, if they are not, you probably missed something, or they are checking their work! What to do if your mind goes blank – most students fear this happening. If it does – put your pen down, take a deep breath, sit back and relax for a moment. If you’re in the middle of an answer, read through what you have written so far – what happens next? If you have to remember formulae, try associating them with pictures or music while revising. If you really can’t progress with this answer, leave a gap. It will probably come back to you once you are less anxious. If you are running out of time – don’t panic. Look at the questions you have left to answer and divide up your remaining time to cover them all. Be very economical – make one point support it with evidence and then move on to the next point. If you really can’t finish in time, briefly list the points you wanted to make – they could pick you up a few marks. Get at least 8-10 hours of sleep. If you are tired, you will not be able to concentrate. You also want to wake up early so that you do not need to rush through having breakfast and getting ready. Check the venue and time of the exam to make sure that you have not confused the day/time/venue. Watch the weather and be sure to plan accordingly if the road conditions may be slowing you down. If you arrive late, no additional time will be provided. Head to the exam with plenty of time to spare. A lot of unexpected events can happen on your way there and you do not want to be late! 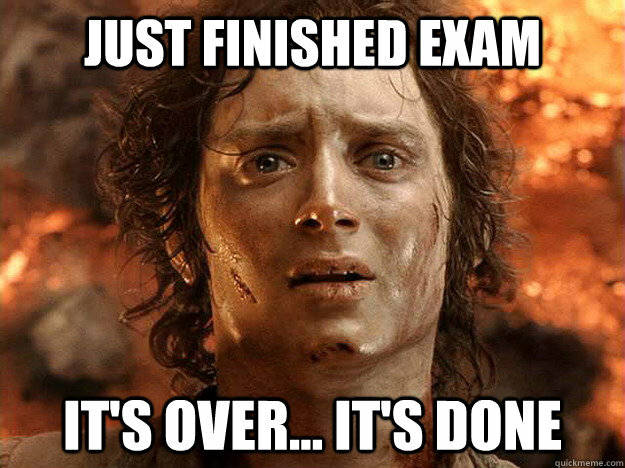 Also be sure to go to the washroom before the exam starts. 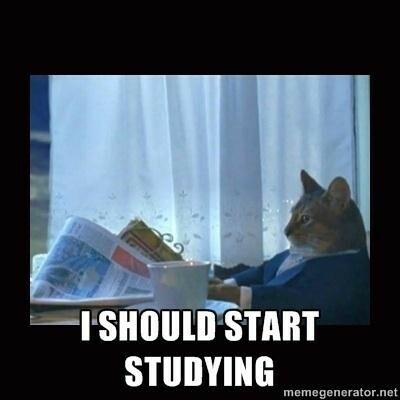 Exams can be quite long and there is no time to waste. Be aware of the area you are planning on sitting in. For example, if there are people around who are panicking, avoid them. They are not doing you any favours! Also if you are easily distracted, chose a location facing a wall or away from the doors so you are not tempted to watch everyone else. Read all the questions carefully before starting and quickly plan how much time to allocate to each to ensure you do not run out of time. And as many rooms do not have a clock in them, bring a watch to help keep you on pace. Look through the paper to check if there are any difficult questions that take a lot of time and leave them to the last. You don’t have to do the test in the order it is written. Work easy problems first to build your confidence and calm yourself down. When coming back to the tough questions, you will know you have at least made a decent grade, and you know how long you have left. Then if you get correct answer to these questions, it’s like you have bonus marks. If your brain freezes, just start writing anything and you will soon start remembering more details. You can always cross off what you wrote and put the correct answer below it once your memory is jogged. Go into the test in a positive manner. It’s proven that if you think that you are going to do well on the test then most of the time your grade will be higher than if you think you are going to do poorly on the material. Notice anything? Like the fact that #15 was skipped?? When this happens, even though I know that the person is answering #16 as though it is #15, I have to mark it wrong. It is such a waste when the person obviously knew the material. Next important thing to remember is NEVER leave any blank questions. Even if you do not know what the answer is, write down anything even if it is just a definition of what the question is answering or an example of when that situation may occur in real-life. Exams within a few marks of passing are remarked and it can be partial marks for these snippets of information that can make the difference between a pass and a fail. Nothing is worse than failing someone who is only a few marks shy of passing but because they didn’t write enough information down, I can’t find them any ½ marks to help boost their grade. And if you find yourself stumped on a question, skip it, and maybe a different question will unknowingly give you information that you can use for the one you were stuck on. 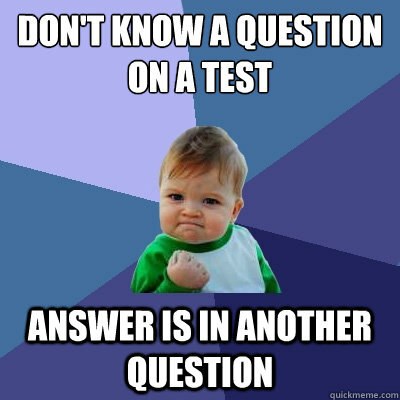 As exams are computer generated from a bank of premade questions, this can happen more often than you think! Read the questions carefully. Read the questions at least twice, in case you missed something before. Underline the keywords in the question. Don’t rush. If possible, read the entire exam through before beginning to work. This will give you an idea of what is in store and will help you to manage your time better. It also prevents any nasty surprises with only a few minutes left. Go with your first answer. Your first answer is probably correct and if you go back and change your mind several times, you are likely to make a mistake due to self-doubt. Use logic when you’re stuck on a multiple choice question. Usually 1 or 2 of the question choices are sometimes wrong, so take those away. Now you should have two answers, so now there is a bigger chance of you getting it right. Now go over everything and find the best answer out of the 2. The key to multiple choice isn’t thinking “Which one is right?” but instead “Which of these are not right?” and using that until you have one answer left. Simple suggestions but when it comes down to those last few marks to pass, they can make all the difference in the world! The Insurance Brokers Association of Canada (IBAC,) who creates the exams, are not trying to trick you with you exam even if it may seem like they are at times. IBAC is simply testing you to ensure that you know your stuff. Because of this, taking a calm approach to the exam will help you find success. •	Information in the exam tends to be in the order of the text book. Therefore if you are not sure if the question is referring to a Farm or Liability chapter, take a moment to think about where the chapter was in the book. If Farm was one of the last chapters but this question is one of the first in the exam, you are likely not looking at a question on Farm Insurance. •	Throughout the text, you will notice that many pieces of information are set up as little clusters which 3-6 point in each. As questions on the exam are 3 mark questions, these nuggets of information are always a good indicator of what information are key topics that you should definitely study. •	Many exam questions are created in a very similar format to the Chapter Checkpoints found at the end of each chapter. These are great questions to study from as they will help you understand how questions will be worded on the exam. 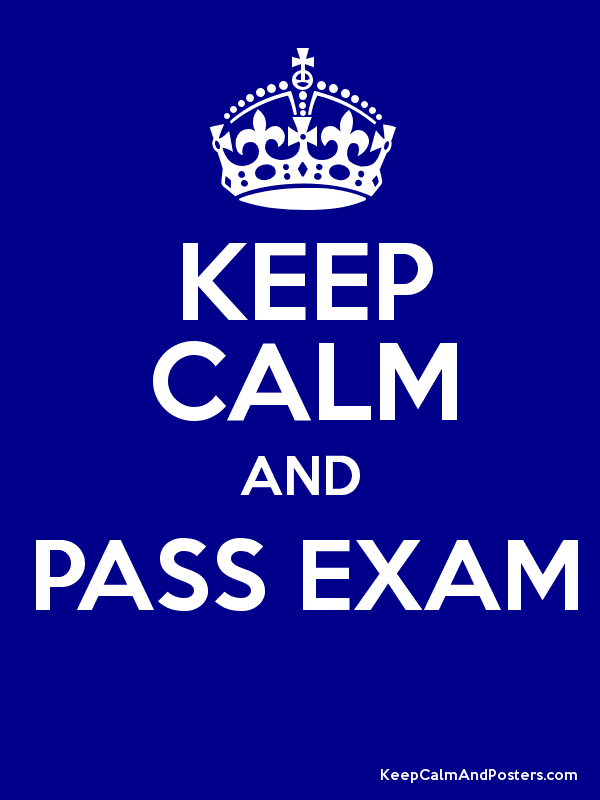 If you are nervous when you open your exam booklet, you need to calm yourself before beginning. Taking a moment read through the entire exam will give you time to focus before you begin writing. It can also help your subconscious start formulating answers to questions without you even realizing it. 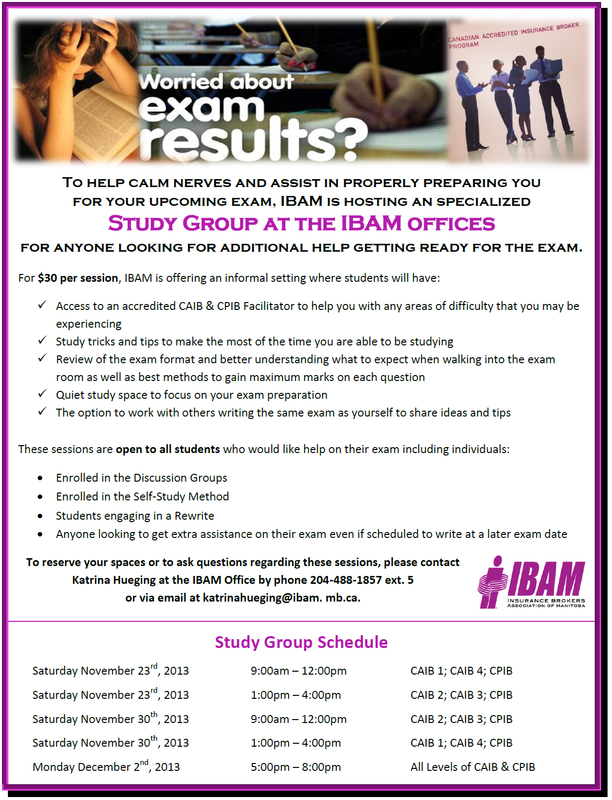 If this is the first CAIB exam that you have ever written or if it has been a while since you last wrote, you will want to refresh yourself on the format of the exam. The CAIB Pass Mark is 60%. All ½ marks are rounded up and anyone who it within a few marks of passing is remarked to see if any additional marks can be found. This is one of the main reasons why I tell my students to never leave a question blank! A partial mark on a couple of questions could be just enough to bump you up to that 60%. 12 Key Terms – These are the definitions that are found at the end of the chapter. Each CAIB level has about 80 key terms so you are absolutely encouraged to learn as many of these definitions as possible – 12 marks can be a substantial part of the exam marks needed to help you pass. 10 Multiple Choice Questions – These 10 questions are A, B, C and D answers. Be sure to read the questions very carefully as a small NOT buried into the question can lead to an absolutely different answer than what you are thinking it is. A great trick is to watch the multiple choice questions as they may be repeated later in the exam which can help you remember what the answer is. 26 3-Mark Short Answer Questions – The simple thing to remember with the 3 mark questions is that you can never be asked for more than 6 points on any given topic (as each point would be worth ½ mark each). So if you find a list of 15 items in the book, you only would need to remember a maximum of 6 of them. Many times the question will not use all 3 marks on one thing but will make 26a worth 1 mark, 26b worth ½ mark and 26c worth 1 ½ marks or something similar. The question will all be on the same topic but this will allow the exam to cover as much information as possible. These exams are composed of all essay style questions. You may have 2 mark questions mixed in with 10 mark questions as you are expected to have a more advanced knowledge of the material at this point of the game. When studying, look for lists of items as they make great long essay style questions such as a 10 mark question of “What could you do in your office to enhance your risk management offerings to clients”. Being able to list the methods you could enforce as well as a brief explanation of each will help ensure your success on the exam. Memorizer – Your main goal is to go over the information over and over again until you just remember it. Understanding tends to not always be the main goal for you as you are just looking to get through the course. Best Method – Use the notes and Chapter Checkpoint to be your goal. For example, read through the Chapter Checkpoints then put the answers away. If you can answer every question for that chapter correctly 3 times in a row, you have got it. Make a mistake? Start back at number one and work on them all again. This constant repetition will help the answers to stick with you. Need to Write it Out – You learn best by putting pen to paper and writing out the information to really make it stick. This might be best used in by completing the Chapter Checkpoints or by making your own notes. Best Method – If you have time, work on the Study Guide. This makes you really carefully think about all of the concepts taught in the book so you know you will have written everything out at least once. Must Understand Concept – You need to really understand the inner workings of an idea for it to make sense with you. Best Method – Teach someone else. Find a friend, family member or co-worker to help you study – the less insurance exposure they have, the better! When you are with them, try to teach them how concepts in the book work. When you teach someone else how to do something, you are learning it better yourself as you might need to explain it two or three different ways before they understand it. Making your brain come up with different ways of conveying the information to your study partner will lock the concept in your head. Need Real-Life Examples – You are hands on learner who always likes to see how something is done or to relate a concept to a situation that you have heard about in the past. Best Method – Use your co-workers and industry colleagues to give you examples. Insurance is a very practical concept that is all around us so ask your facilitator or manager for a time when a situation may have arisen that uses the ideas being taught. By remembering the story that happen, you will remember what the coverage was for and how it works. Winging it – This is also known as the Hail Mary play. While some may manage to scrape by with this method, you are not doing anyone any good by not properly learning the material. My vote – pick a different learning style and get cracking on that method!